Foundation is my playground. There’s nothing I love more than testing different formulas in a bid to find the best. 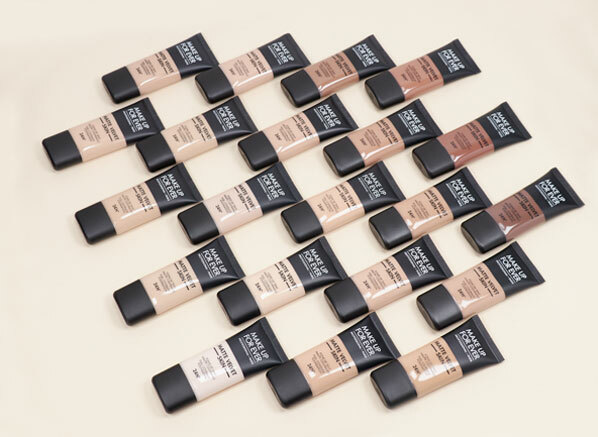 This time, it’s the new MAKE UP FOR EVER Matte Velvet Skin under the spotlight; a matte foundation that’s getting rave reviews for it’s long-lasting, high coverage and comfortable formula. 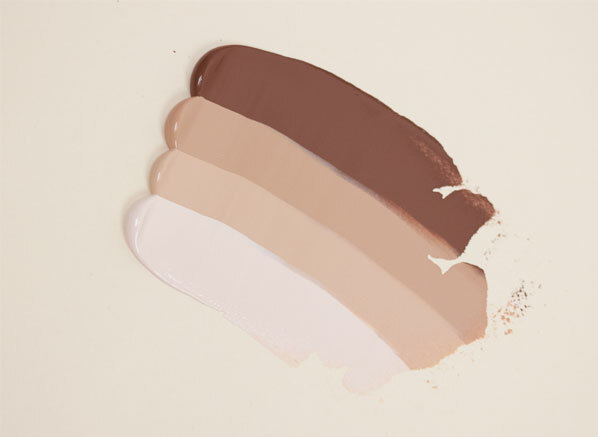 No, you didn’t read that wrong, everyone’s writing home about the fact that this matte foundation is the most comfortable and natural-looking yet. Before we get started with this review, it’s important to note that Matte Velvet Skin isn’t completely brand new, it’s actually a reformulation. Its previous version was known as Mat Velvet +, which has now been discontinued. 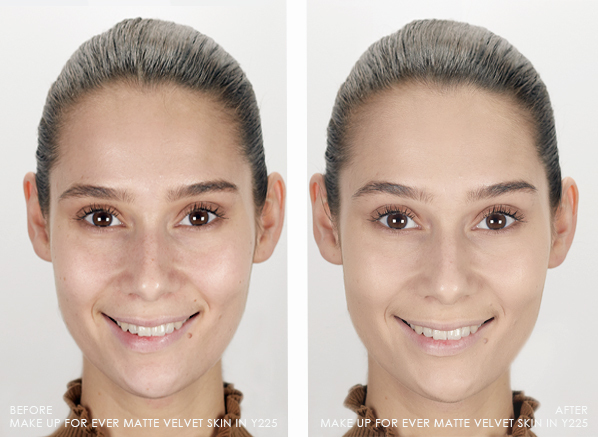 But don’t worry if you loved that foundation, Matte Velvet Skin offers the same benefits and more! One of the main differences between the two (beside the name and packaging) is the texture. Mat Velvet + had more of a liquid texture, whereas, while Matte Velvet Skin is a liquid it is definitely more creamy and not as watery. Another point of difference is that the new Matte Velvet Skin is waterproof with 24 hour wear; Mat Velvet + only offered only a water-resistant formula with no specified wear-time other than ‘long-lasting’. The Finish: As the name suggests Matte Velvet Skin leaves a matte finish on the skin, making it a perfect fit for oily and combination skin types. This matte finish is unlike others on the market though, it’s formulated with synthetic mica, which absorbs excess oil but also has texturising and light-reflecting properties that ensure your skin looks natural and velvety, never flat or mask-like. The Coverage: Matte Velvet Skin is extremely buildable but not at all cakey and it won’t clog pores. You can achieve a medium coverage, or layer it to achieve a fuller coverage. A crucial part of Matte Velvet Skin’s formula is a flexi-fit complex. This unique technology, along with film and micro powders, is what make the base so comfortable to wear; they allow skin to breathe and also help it adapt to facial movements. The Wear Time: This foundation means business. It offers a 24 hour wear-time, plus a waterproof formula (which I can completely vouch for) thanks to film-forming agents and hydrophobic pigments. They lock in the powders, boost the foundation’s resistance and provide long-wearing coverage that doesn’t flake or crack. • Y205 – Alabaster is a very fair ivory shade with a yellow undertone. • Y215 – Yellow Alabaster is a fair to light shade with a very prominent yellow undertone. • Y225 – Marble is a light shade with a warm hue best suited to skin with yellow undertones. • R230 – Ivory is a fair to light shade that has a red shift. • Y245 – Soft Sand is a light shade with a neutral to yellow undertone. • Y255 – Sand Beige is a little lighter in tone to Y245 and has a yellow undertone. • Y305 – Soft Beige is a light to medium shade with a neutral to yellow undertone. • Y315 – Sand is a light medium beige shade with a yellow undertone. • Y325 – Flesh is a light beige with a neutral to yellow undertone. • Y335 – Dark Sand is warmer than Y325 and has a yellow undertone. • Y345 – Natural Beige is a light medium shade with a yellow undertone. • Y365 – Desert has a warm beige hue and yellow undertone. • Y375 – Golden Sand is a camel shade with a warm, yellow undertone. • Y405 – Golden Honey is light fawn shade with a yellow undertone. • Y415 – Almond is a medium shade with a yellow undertone. • Y425 – Honey is a medium to tan shade with a yellow undertone. • Y445 – Amber is a medium caramel hue with a yellow undertone. • Y505 – Cognac is a medium to dark chocolate hue with a red undertone. • R510 – Coffee is a dark chestnut shade with a very strong red shift. • R530 – Brown is a deep brown shade with a red undertone. • R540 – Dark Brown is a deep ebony hue with a red undertone. I have to kick off this section by saying that, in my opinion, everything MAKE UP FOR EVER says this foundation offers is 100% accurate. Not only did it give flawless coverage, but it felt like nothing on my skin and I can completely vouch for its waterproof claim – it didn’t budge! I used the MAKE UP FOR EVER Silex Blender Sponge to apply the base above. I generally use a sponge to apply foundation as I prefer the finish, however, if you wanted even more coverage I’d recommend using the MAKE UP FOR EVER Foundation Brush – Small – 104. In terms of finish, the result was definitely matte, however it did still look very natural on my skin. For me, there’s nothing worse than a matte that looks as if it’s dried out your skin, but luckily that didn’t happen here! What about the 24 hour wear time? Well, I’ll be honest I didn’t wear the formula for 24 hours as I’m a big advocate for not sleeping in foundation, but I did wear it all day, for as long as possible and other than a little wear on the chin (I’m terrible for touching my face throughout the day), it really held its own. I give this foundation a huge thumbs up! I’d also recommend it to all combination and oily skin types, but also normal skin types who like more of a flawless matte finish too. The only skin type I’d say to perhaps avoid it would by very dry skin as you may prefer a more hydrating base like MAKE UP FOR EVER Water Blend. On the other hand, if your skin is very, very oily you may also want to checkout the MAKE UP FOR EVER Skin Blurring Powder Foundation, a powder base that you could use alone of pair with Matte Velvet Skin for extra coverage and mattifying power. This entry was posted on Friday, October 12th, 2018 at 5:25 pm and is filed under Make-up, New products, Spotlight On, Swatches. You can follow any responses to this entry through the RSS 2.0 feed. You can skip to the end and leave a response. Pinging is currently not allowed.